IFBN partnered with Bigbasket to provide a platform to the customers of Bigbasket to donate food and spread happiness this Diwali in a collaborative Action against Hunger. The customers responded enthusiastically and donated combo packs of good quality wheat Flour Atta and cooking oil. 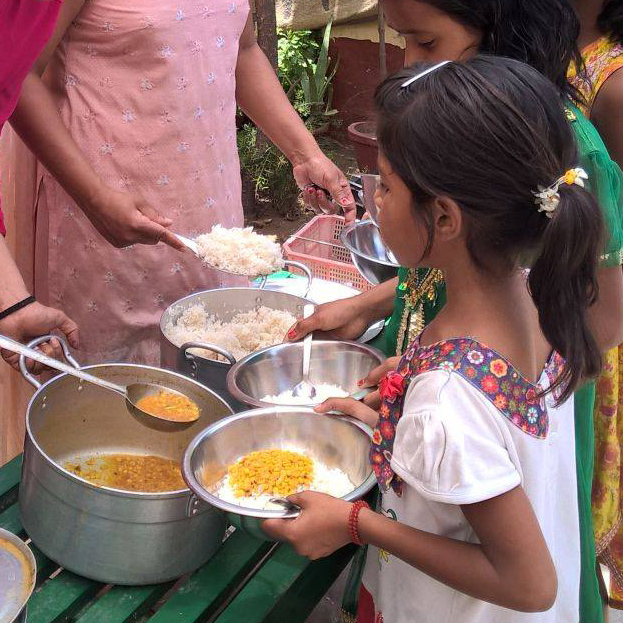 IFBN connected the donated ingredients to support families and individuals in need in 3 cities – Hyderabad, Noida and Mumbai. This helped to reduce some financial pressure on those families and while some had a good meal others could also celebrate Diwali bringing great joy to their children. IFBN is serving 1 million meals to children in 11 schools in 4 cities in collaboration with the Rotary India Literacy Mission (RILM) and Rotary Clubs. RILM under its T.E.A.C.H program ensures overall development of out of school children and children in Happy Schools by focusing on teacher support, e-learning, literacy and child development. IFBN brings synergy to this program by taking care of food and nutrition of school children. Millions of children go hungry everyday in India. We at India FoodBanking Network have taken a pledge to alleviate hunger and support feeding programs across the country. Our Corporate partners and hundreds of NGOs are supporting us to serve meals at schools for underprivileged, orphanages, old age homes, hospitals, etc. CII-Food and Agriculture Centre of Excellence in partnership with Global Alliance for Improved Nutrition (GAIN) organized a National Consultation on Nutrition – Business Models for Securing Nutritional Outcomes on 25th August in New Delhi. This is the first consultation of the CII-FACE National Nutrition Initiative -Swasth Bharat Sashakt Bharat. On 14th July, 2014 Rotary Club of Culcutta Mahanagar established West Bengal's first FoodBank and joined IFBN's vision of eliminating hunger in India. Cargill India in partnership with India Food Banking Network supported a Food Bank in Haryana – The Gurgaon FoodBank. DLF Foundation provided warehouse support to the Delhi and Gurgaon FoodBank. The Gurgaon FoodBank was launched in Gurgaon on the 11th of November, 2013 to give assistance to the various feeding programmes in Gurgaon and its neighbouring areas.